It was the fall of the year in 1949. School days at Brigham Young High School were already beginning to run together in our minds, and it got so we hated to get up each morning to face teacher George Lewis. We decided it was time for a break. A group of BY High boys started to talk together about how great it would be to spend our next Saturday in the great outdoors. 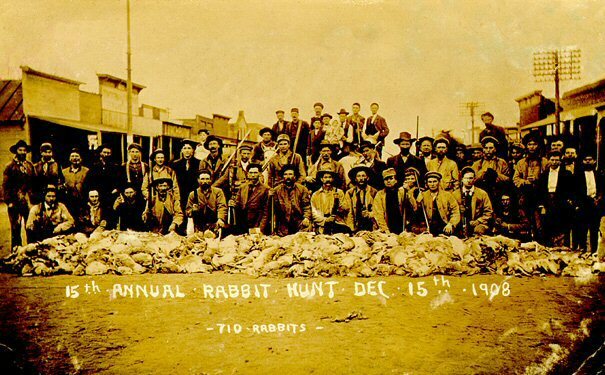 We developed a plan to go rabbit hunting near Goshen, Utah, an area then and perhaps even now recognized as the extreme border of human civilization. I volunteered to drive my old Model A Ford, which could "comfortably" seat at least six if its rumble seat was open. We began to gather at the school before daybreak. I believe the group started out with Jim Webster, Dave Young, and perhaps Eddie Maloney. Then along came Stan Collins, Mick Eggertson and Mo Jackson. Dallin Oaks and Eldon Lloyd had wanted to go, but could not make it. We started off in high spirits, enjoying every mile in the crisp morning air. The trip one way was a 90-minute drive on a good day, in a good car, but it was soon obvious that my Ford was simply not up to the job. While sputtering and jolting its way south, it suddenly gave up the ghost just before we reached Spanish Fork. A helpful passer-by pushed us into the nearest service station. The guy in charge carefully looked over my car, which was an antique even in 1949. He shook his head sadly, and said he was doubtful that he or anyone else could fix it. However, like every good mechanic, he decided to try anyway. Stan Collins and Mick Eggertson did not want to waste any hunting time, so they grabbed their shotguns and began to prowl through a nearby field in pursuit of elusive local rabbits. Mo Jackman and I stayed at the station to encourage our master mechanic in his efforts to repair our one and only mode of transportation. Both efforts came up short. Our trip to Goshen was obviously a lost cause, so we decided to focus our brainpower on seeing if we could get other motorists to push us all the way back to Provo, under the guise of trying to help us get our engine started. This plan worked surprisingly well; we skillfully recruited four separate sets of "pushers" that afternoon. Each of them pushed us for several miles until they realized our scam -- we had no engine to start. By the time we reached the southern outskirts of Springville, however, nightfall was upon us, and we could no longer recruit willing "pushers" with our honest and forlorn faces. We talked it over and decided our best plan was to abandon the Model A on the side of the road and divide into two-man groups in order to more effectively hitchhike home. It would be no easy job to find anyone willing to stop for teen-age boys carrying shotguns. Mo Jackman and I set off down the road together. After many failures, we managed to get the driver of an old wreck of a car to stop for us. Our good Samaritan invited us to climb into his "back seat" which consisted of an old mattress and a high pile of musty blankets and pillows. To fit in, we had to lie on our backs on top of the pile of foul-smelling bedding. We held our shotguns between our legs. Our faces were pressed almost against the roof of the old car. Every time the car hit a bump -- which happened frequently -- our noses got flattened and our shotguns dented the roof of the car. We were working hard to suppress our laughter, but the old guy driving the old car was oblivious to any problems. He drove up University Avenue and dropped us off in the dark at BY High without a word. We were grateful to him, although we wondered what he might say when he discovered the additional damage we had inflicted on the roof of his beat-up old jalopy. The next day, my Dad drove us back to Springville to get the Model A where it had come to rest. We towed it home, but it, like our hunting trip to Goshen, was hopeless. I later sold it for $40 to a student from Provo High, and felt lucky to have found a willing buyer. Despite its problems, however, our outing and our varied experiences getting home did serve to clear our minds, and it also generated an ever-growing supply of jokes and stories with which we regaled our classmates and girlfriends, including Louise Blackham, Anna Lou Miller, twins Marion and Marilyn Norton, and Mary Alice Sauls, during the following winter months at BY High. 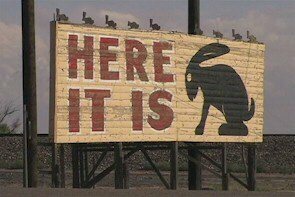 It always brings a smile to my face when, at odd times, the thought crosses my mind that whole generations of rabbits in the badlands around Goshen owe their present existence to the providential breakdown of my old Model A way back in the fall of 1949. Jack Rabbit Pioneer Monument . . . near Goshen.